← Moreover, they’re at it again. Last night I attended the Scottish première of Anthony Baxter’s new documentary You’ve Been Trumped – it’s actually the second time I’ve been to a première in Aberdeen having seen the debut of Fraser Denholm’s Run Down Aberdeen earlier in the year. Trump’s PR machine have branded Anthony Baxter a “fraud” and his film a “failure“. While Donald Trump may be eminently well qualified to talk about failure having been behind plenty of them (Time Magazine saw fit to publish a list of The Top 10 Donald Trump failures), I contend that on seeing this work few people (outwith the cadre of salaried sycophants Trump surrounds himself with) would consider this film a failure. If what I witnessed at The Belmont Cinema last night was a failure then I really wonder what a success would look like. If the purpose of documentary film making is to engage the audience and provoke discussion then this was no failure. I’ve been on the protest marches and walked the ground but what I saw in that film genuinely shocked me. Maybe its different up in Trump-world but here in Aberdeenshire amongst us wee guys on the street the rapturous applause that the director, producer, their film and every one of the residents of Menie received from the audience wasn’t a sign of failure. In a nutshell, the film has stunning visual images and in places is intercut with scenes from Local Hero to tell the story in a way that is truly something special and will not only engage audiences but potentially change the way that people think about the whole issue. During the screening there were gasps of horror at some of the scenes, clapping at others, one or two laughs and a standing ovation at end. As I walked down Schoolhill and heard the beat of drums I knew this would be a special evening and on turning into Belmont Street to see the crowds outside the cinema was delighted to see it was the exuberant Guarana Street Drummers who were performing. I was lucky enough to get there in time to see the VIPs assembled on the green carpet outside the cinema. This is one of the most powerful pieces of documentary film making I have ever seen. It is everything that a documentary should be – visually stunning, highly informative and the director goes to great lengths to endeavour to show both sides of the story. While the cinematography is breathtaking the story itself is heart-breaking but through it all the strength and courage of the residents of Menie is truly inspirational. 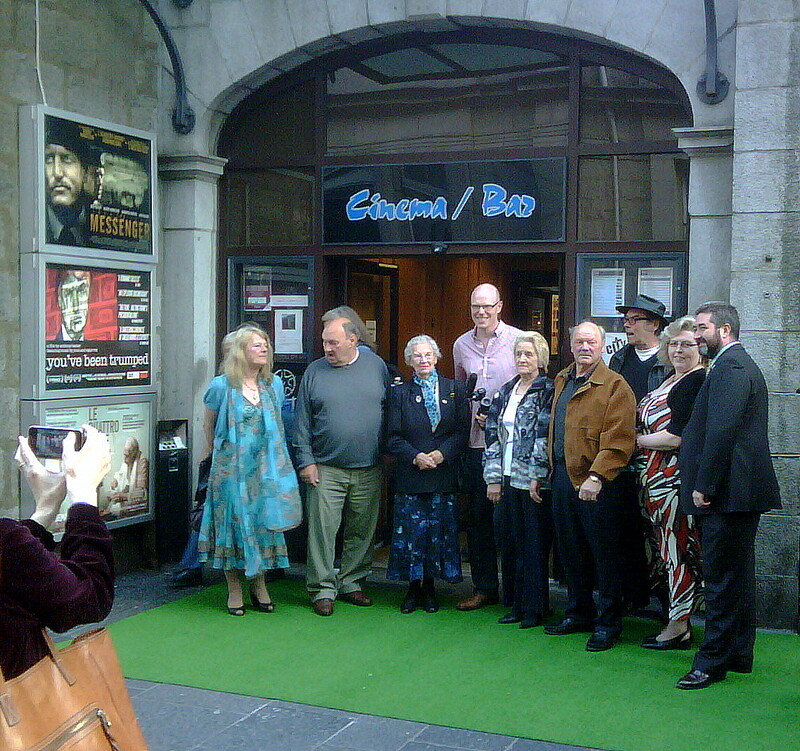 To see Susan Munro, Walter Forbes, Molly Forbes, Sheila & Michael Forbes, Mickey Foote, Moira & David Milne assembled together with director Anthony Baxter on the green carpet was really special. To share the experience of the première with them was an honour. During the screening time and time again I found myself subconsciously thinking about the monumental works of John Pilger in particular his Stealing a Nation (which deals with government machinations to ensure that “inconvenient” natives don’t get in the way of a US airbase) and his most recent work The War You Don’t See which deals with the concept of how “embedded journalists” existing under the threat of being denied access to the war zone can be manipulated by governments. This has many parallels with how The Trump Organisation deals with the local media here. With an award-winning documentary film made by a film-maker from North East Scotland about a current issue in Aberdeenshire that’s attracting global attention, many would have expected the local media to have been out in force … but as I often say in these posts this is Aberdeen and the local press opted not to mention the film at all on Friday. Still Channel 4 News and The Times have seen fit to go where Aberdeen Journals fear to tread and have run articles on the event … and there will be many, many more. For an up to date and comprehensive review of the whole Menie saga, I strongly recommend reading a copy of Andy Wightman’s report Donald Trump’s Ego Trip : Lessons For The New Scotland. In the pages of that report you’ll find the information that you wont see in the local newspapers who would apparently rather peddle property developers PR than engage in real journalism. So to sum up yes I’ve been opposing this developement since the first time I saw what it involved … and I’d oppose this regardless of the developer involved. I have written to my councillors and been ignored, I’ve been on the marches and been at the protests so I do think I’ve got a reasonable idea of what is going on yet as I said before what I saw in the film really shocked me. Fellow Aberdeenshire blogger MisssyM has already posted an excellent and extremely comprehensive review of the movie here, so read this one too and form your own opinion. P.S. One final little point … we are always told about the over-riding economic benefits that the development brings … yet while watching the film I couldn’t help noticing the shots of Les Taylor heavy plant equipment in action … far from benefiting from a Trump-fuelled economic boost, Mintlaw-based Les Taylor entered administration in January 2011 with the loss of 160 jobs in Buchan – no local economic spin-off there then. This entry was posted in Aberdeen, Aberdeenshire, Aberdeenshire, Aberdeenshire Council, Environment, Green, media, newspapers, planning, Scotland, Trump and tagged Aberdeenshire, Dcoumentary, Environment, Film, Golf, Menie, Movie, News, Scotland, Trump, You've Been Trumped. Bookmark the permalink. Great article and good to see that your photograph seems to have been taken by the You’ve Been trumped guys asa symbol of the night. You are right- it was an honour to be in the same room as those brave people. We spoke to Susan Munro outside and briefly to Mickey Foote. I am in awe of their dignity in this situation. i don;t think i would be so clam were it me in their situation. Having recently enjoyed reading Jon Ronson’s the Psychopath Test, I was wondering how many boxes Trump would tick? Certainly, there’s “glibness and superficial charm” as well as the “grandiose sense of self-worth”. Again, pathological lying and lack of remorse or guilt are clear for all to see. There’s that failure to take responsdibility for his own actions, and, since he always gets away with it, criminal versatility, too. As Ronson reminds us, individual psychopaths can have devastating effects on those around them, but corporate psychopaths, such as Trump. with aspirations to become President, can effectively damage the entire planet.